Is your 2015 resolution to get out of debt? If so, Dave Ramsey promises to make you debt-free. Dave says in his blog "You can get out of debt no matter how much you owe!" He tells you how people act that are debt-free in his article "7 Characteristics of Debt-Free People." Debt-free folks are wise, patient, confident, goal-driven, responsible, not materialistic and willing to make sacrifices. The question in my mind is "Are we ever really debt-free?" I've never had a month where I didn't have to write a check for a bill or schedule a payment on the world wide web. Think about it. If you're alive and want to stay warm or cool, you'll always have a utility bill. If you want to stay connected and be mobile, you'll always have a cell bill. Unless you use an antennae, you've got a cable bill. Then there's insurance if you want to drive or be healthy and oh, let's not forget taxes! You will even incur debt as you draw your last breath and someone else will take care of your bills after you're gone. Can we ever be truly debt-free? John 8:36 says "If the Son therefore shall make you free, ye shall be free indeed." Our souls are the only thing about us that can truly be debt-free because Jesus paid it all. As the old song goes, "All to him I owe". Except, I don't owe him. His grace and mercy are free. You don't owe him either. You don't have to be wise, patient, confident, goal-driven, responsible, not materialistic or willing to make sacrifices to become free indeed. You do have to believe in Jesus unto salvation with your whole heart and love your neighbor. You may already be monetarily debt-free as much as is possible but your soul may be burdened with a debt you can't pay. Have people seeking to be debt-free heard Jesus is the ultimate sacrifice for our freedom? I'm glad some people are still willing to make sacrifices but that went out of style about 2000 years ago. Make your 2015 resolution to get out of debt, not materialistically but...spiritually. Become a living sacrifice. 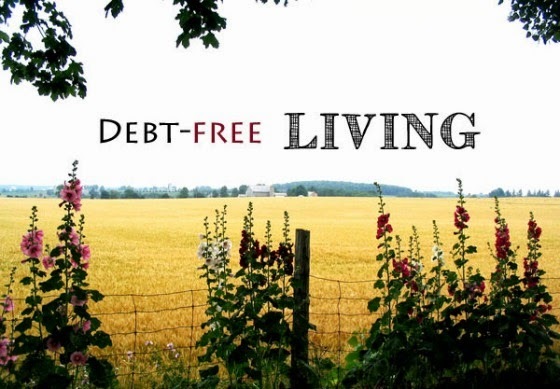 Jesus can give you new meaning to Debt-Free Living!